Makati City – Conflicts and wars have continued to displace people from around the world. Although the outcome is uncertain, millions have sought refuge in different countries to escape suffering and to live a better life. The aggression towards the Jews in Germany during the 1930s opened the door for a good relationship between the German Jews and Filipinos, between whom a Treaty of Friendship was formally established in February 26, 1958. The Jew population in the Philippines can be traced as far back as 1870, when the Levy brothers, who were natives of Alsace-Lorraine, entered as refugees from the Franco-Prussian War. The three siblings made a living by establishing different business enterprises, including Swiss watches, automobiles, and pharmaceuticals, which were mimicked later on by other Jewish immigrants who settled in the country. The proliferation of Jews was more apparent throughout the end of the Spanish colonial period following the inauguration of the Suez Canal in 1869. It provided a direct trading route between the Philippines and Europe, thus granting more access for other foreign business owners to trade in the country. When Adolf Hitler ordered the extermination of Jews in Europe, more than a thousand fled to the Philippines to start a new life. 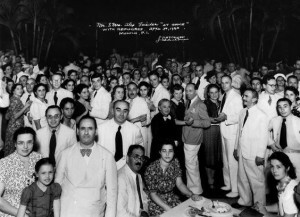 Jewish refugees arrived during the Philippine Commonwealth Government under President Manuel Quezon, who organized the rescue plan along with Army Colonel Dwight Eisenhower, cigar maker Herbert Frieder and his sons, as well as the American High Commissioner to the Philippines Paul McNutt. President Quezon’s open-door policy offered to admit 10,000 refugees and distributed some of his private lands in Mindanao and Marikina as a new settlement of the newly-arrived European Jews. Escaping from the Nazis, the Jewish refugees, who mostly originated from Germany and Austria, thrived well in the islands. They were regarded extremely well by the locals and were able to practice their religion, as well as allowed to own businesses. Many of them survived the Japanese occupation of the Philippines in 1941 and received far better treatment compared to the Filipinos. The country’s first synagogue was built in 1924 along Taft Avenue in Manila by the region’s oldest Jewish community. It was financed by Emil Bachrach, an American Jew who permanently resided in the country in 1901. Subsequently, a much-improved temple was opened later in 1982 that is composed of a large kitchen, classrooms, a library, and a mikvah. Presently, there are an estimated 200 to 500 Jews living peacefully in the Philippines. When the war ended, many immigrants stayed behind, while others either moved to the United States or resettled in Israel. The friendship between Filipinos and Jews further developed following the support of the Philippines to the appeal of the United Nations to partition Palestine into separate Jewish and Arab states. The Philippines was the only Asian nation to vote for this plan. In effect, Israel, the solitary state in the world with a majority Jewish population, declared its independence in 1948. More than 80 years since, the Jews have never forgotten the act of hospitality shown by the Filipinos who opened the doors for the Holocaust survivors. The Holocaust Memorial Park located in Rishon LeZion, Israel was unveiled in 2009 to honor the momentous and intangible relation between two countries. A one-hour documentary entitled “Rescue in the Philippines” chronicled the harrowing escape of Jews along with their migration to the Philippines. After Typhoon Haiyan devastated the nation in 2013, the Jews were among the first to send in relief workers spearheaded by Danny Pins, the son of a Jewish refugee to the Philippines. There are an estimated 40 refugees still living at present who are forever grateful to their former home in the tropics. Today, the Jewish population in Manila is still flourishing and continues to be an exciting and hospitable community.